You might not notice these memorials walking around German cities like Berlin. There is so much to see at eye level, it is easy to miss the subtle, gold plaques placed within the sidewalk at the entrance of many residences, businesses, and still empty spaces. Stolpersteine literally translates to "stumbling stone" and these understated remembrances softly remind those passing by of the vast history that lies at your feet around Germany. 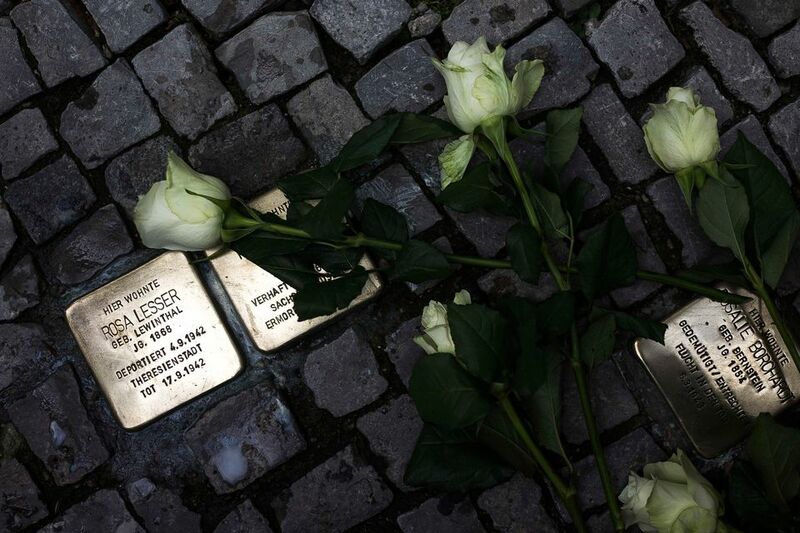 Created by German artist Gunter Demnig, Stolpersteine commemorate victims of the Holocaust in cobblestone-sized brass memorials marked with a name (or names of the family), date(s) of birth and a brief description of their fate. Usually, they state "Hier wohnte" (here lived), but sometimes it is the place the person studied, worked or taught. The ending is usually the same, "ermordet" (murdered) with the infamous locations of Auschwitz and Dachau. Unlike other memorials around the city dedicated to specific groups (such as the Memorial to Murdered Jews of Europe), this is an inclusive memorial for all of the victims of the Nazi regime. This includes Jewish citizens, Sinti or Roma, victims of political or religious persecution, homosexuals as well as victims of euthanasia. The project has grown to include over 48,000 Stolpersteine not just in Germany, but in Austria, Hungary, the Netherlands, Belgium, the Czech Republic, Norway, Ukraine, Russia, Croatia, France, Poland, Slovenia, Italy, Norway, Switzerland, Slovakia, Luxembourg and beyond. Despite the small size of each individual project, its vast scale has made it one of the world's largest memorials. There is hardly a German town without a Stolpersteine memorial. The capital of Berlin has the most with almost 3,000 Stolpersteine to commemorate the 55,000 people deported. A comprehensive list of locations in Berlin can be found online, as well as listings around Europe. However, visitors usually come across the stones organically by just turning their gaze to the ground. When you catch sight or stumble over a stone, read the Stolpersteine's short story and remember those that called this city home. The memorials creator, Demnig, continues to direct the implementation of the Stolpersteine. Now in his late 60s, Demnig has a team to do the heavy lifting but approves applications, checks the validity of the details and personally plans the layout of the stones. Michael Friedrichs-Friedländer is his partner in the work, making and embossing about 450 Stolpersteine a month. The installation often draws the attention of the residents, such as this post by an expat in Berlin who watched an installation come together in front of her building. A calendar of events and opening ceremonies, past and future, can be found on the website and attended by the public. The cost of the Stolpersteine is largely covered by donations as anyone can initiate and fund a memorial. It is up to those nominating a project to research the details and submit it to Demnig's team. The current price of a new Stolpersteine is €120. As the memorials popularity has grown, spaces for new memorials fill quickly. Find more information on the memorial and contributing on the English language version of the site, www.stolpersteine.eu/en/.